1 1 François Bussiere Head Jun 2 1860 Québec 40 M M Tailor Canadian Roman Catholic 1946 rue Notre-Dame, Earnings $2500. Can read and write. Spoke English and French. 2 1 Bridget Bussiere Wife Nov 14 1863 Québec 37 F M Canadian Roman Catholic Can read and write. Spoke English and French. 3 1 May Bussiere Daughter May 18 1885 Québec 15 F S Canadian Roman Catholic Can read and write. Spoke English and French. 4 1 Veronica Bussiere Daughter Dec 6 1891 Québec 9 F S Canadian Roman Catholic Can read and write. Spoke English and French. 5 1 Francis Bussiere Son Jul 5 1895 Québec 5 M S Canadian Roman Catholic Spoke English and French. Le cinq Fevrier Mil huit cent quatre vingt trois, vus la dispense de deux bans de mariage accordee par Messire Adolphe Marechal Vicaire General de Monsiegneur l'Eveque de Montreal et apres la publication du troisieme ban faite au prone de notre Messe paroissiale ainsi qu'a St. Jean Baptiste d'Ottawa comme il appert par le certificat de Cure du lieu entre Francis Antoine de Bussiere, tailleur, domicilie a St. Jean Baptiste d'Ottawa, fils majeur de Antoine de Bussiere et de Marie Drolet de Ste. Anne de Montreal, d'un part et Bridget Mary Barry, fille mineure du feu David Barry et de Mary O'Leary de cette paroisse d'autre part, ne s'etant decouvert aucun empechement, Nous soussigne, Vicaire de cette paroisse, du consentement de la mere de la partie mineure, avons vecu leurs mutuel consentement de mariage et leur avons donne la benediction nuptiale en presence de William Barry, frere de l'epouse et de Annie O'Farrell, qui ainsi que les epoux, ont signe avec nous. Lecture faite.
? Roussin, pte Vic. (signature)"
Bridget Mary Barry was 19 when she married Francis Antoine, but was still considered a minor. Francis Antoine is noted as being from St Jean Baptiste d'Ottawa parish. In that he was noted as a clerk in the 1881 Census, he may have gone to Ottawa to learn his trade as a tailor. By 1901, he and his family are living back in Montreal. The family name is noted as "de Bussiere". Although family records have indicated that Bridget was born in 1863, the 1881 Census notes her as being 16, therefore she would have been born around 1865. Her sister Mary Jane is noted as being born in 1863. 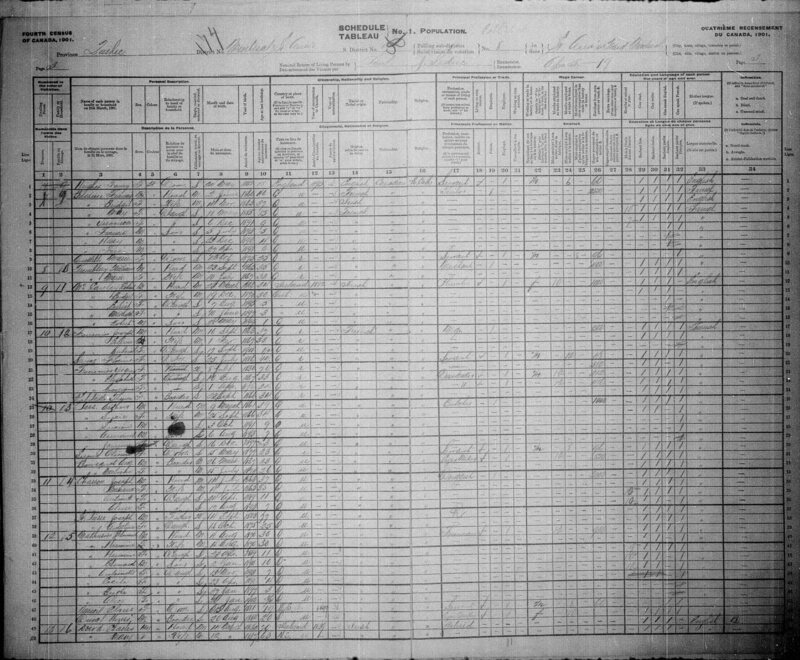 Parish Registers sourced from Institut Drouin confirm that she was born in November 1862 in Montreal. She is buried in the family plot at Notre Dame des Neiges Cemetery in B418.